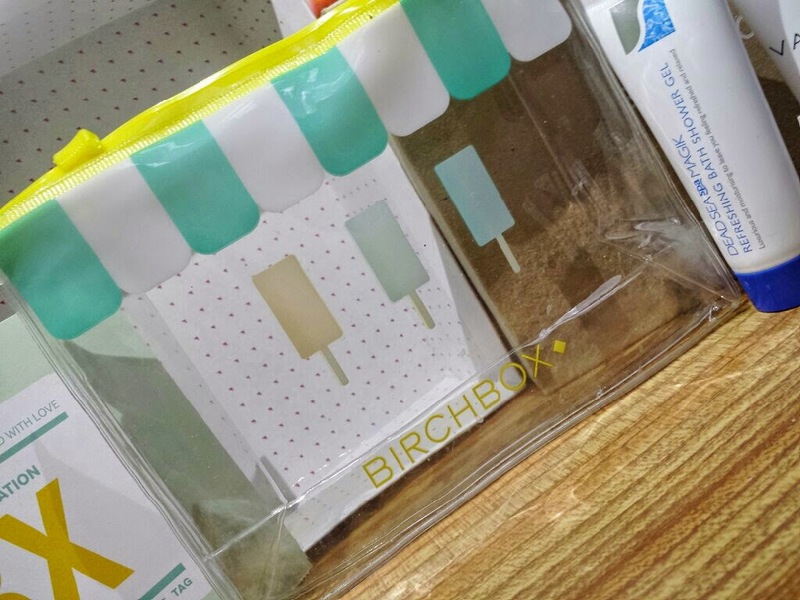 After seeing the box spoilers on the Birchbox website, this was the one product that I had my fingers crossed for! Brighten Up is an exfoliating cleanser that features papaya enzymes to help break down dead skin cells to provide you with a radiant glow. Dermatologist-grade Microderm Crystals gently exfoliate away dead skin to reveal your bright and happy new skin underneath whilst coconut and aloe vera combine with a mild cleanser to clean away the dirt. You only need a small pea-sized amount for your whole face so the sample is also a great size. The product itself is thick and white with a sand-like texture. Some exfoliators have bigger particles in them that are more sparsely distributed through the cream. This exfoliator is very condensed so there is a lot of grittiness to provide gentle exfoliation without the scratching that can occur with others. I haven't yet used this product often enough to report on any long-term results, but I do love the feel of my skin after use. My face feels really smooth and clean without feeling that it had been over exfoliated or over cleaned. I'll report back again with an update after I've used it more! If you want to buy a full size tube, you can pick one up from Birchbox for £26 for 120ml. This was another product that I was hoping to receive this month! 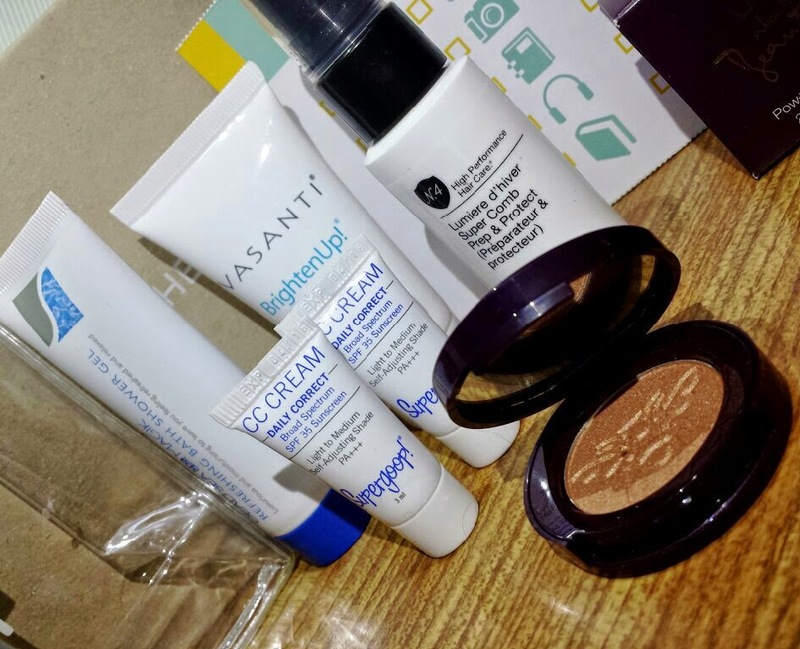 I have been eager to test out another CC cream after trying L'Oréal's Anti-Redness CC cream (which made me look a bit orange! ), so I was really happy to see this! 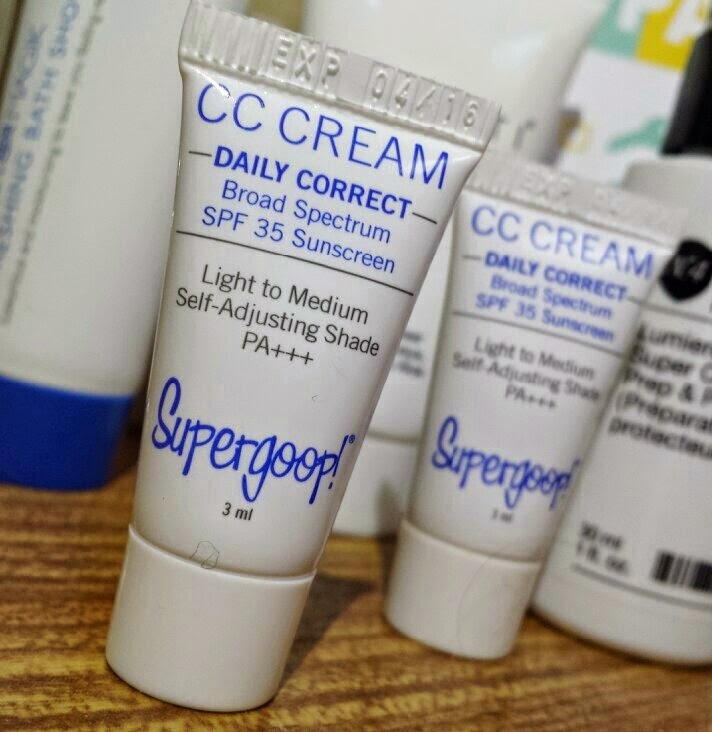 The Supergoop CC Cream contains light-diffusing mica minerals that soften the appearance of pores and help to provide a flawless looking complexion. 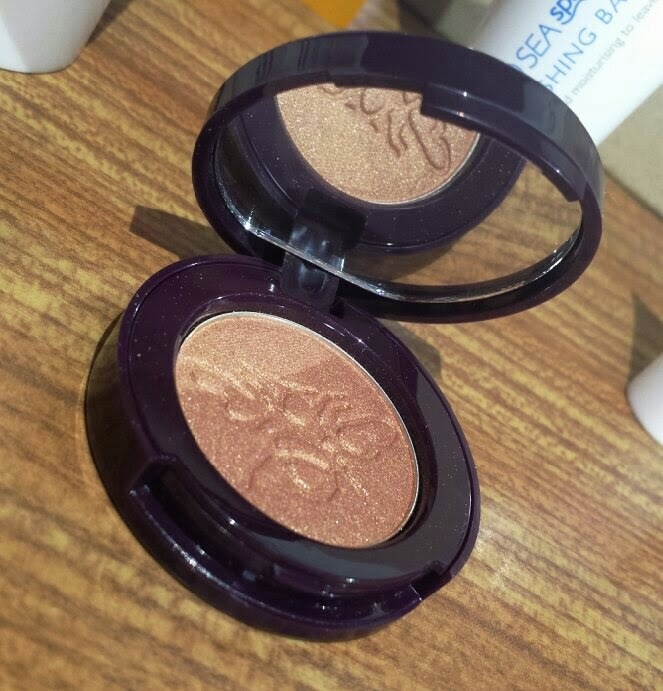 It also contains SPF 35 and uses 100% natural ingredients. At first I wasn't sure if there was an accident and that I had mistakenly received two samples of this cream, but on further thought I think that this is probably due to the fact that the sample is really tiny! I can only imagine that a lot of people would have been disappointed so adding a second helps to counter that I suppose! The texture of this cream is pretty thick and reminded me a lot of L'Oréal's Skin Perfection BB cream when observed coming straight from the tube. Applying to the skin is pretty straightforward, using your fingers and gently blending onto the skin. It states that if you need extra coverage then you are able to build it up where necessary. I found this cream to be really lightweight and low coverage. Even when I tried to build it up there were patches that were still in need of concealer.i didn't see any difference even when built up! However, this cream doesn't claim to be high coverage or to hide things such as blemishes. Therefore, I am not bothered about that element. This cream did even out my skin tone everywhere else though and wasn't cakey at all, even where I built it up! It adjusted really well to my skin tone and created a naturally-flawless look on the clear areas of my skin. Also, it didn't aggravate my oily skin. It doesn't mattify the skin, but it keeps the oil under check and looking luminous rather than greasy. On days where my skin is looking okay blemish/redness wise, I can imagine appreciating this product a lot more! I can totally see this being a great Summer buy for all skin types. The lightweight finish and feel on the skin is a great surprise after seeing the thickness when it first emerges from the tube, and the speed of application and overall results are really appealing. I don't even mind adding a bit of concealer where needed. I don't feel like I have anything on my face! I received the shade Light/Medium which suited my light skintone, but you can also pick up a tube in Fair/Light and Medium/Dark. You can pick up a full size tube from Birchbox for £32 for 47ml. After receiving the Gilchrist & Soames English Spa Sea Kelp Extract Mineral Bath last month and enjoying it thoroughly, receiving this was almost like an addition to it due to the similarities between them. This is another aquatic scented, blue body wash that contains sea-based minerals to cleanse your skin. Again it can also be used as a bubble bath or a shower gel. This body wash is very thick, bright blue and glittery. I won’t lie, it's pretty awesome. The colour was beautiful and the micro glitter reminded me of those novelty body washes that you buy for all your friends when you’re really young, but this was like a grown up version. The smell is beautiful. I seem to have a bit of a thing for aquatic scents lately (I think it’s the Summer months that do it), so I really enjoy that aspect. I have tested this product out as both a shower gel and bubble bath, so I’ll explain my results from both methods. As a shower gel this product is quite thick and doesn’t lather too fantastically. That results in you needing to use quite a bit of soap to cover your entire body. However, it does leave your skin feeling really clean and fresh. It is also soft and rejuvenated! As a bubble bath you definitely get more of a lather in the water, but it does tell you to use a generous amount. I tried to use the same amount as I did when I used it as a body wash for comparison purposes and I got some alright bubbles from it, but they weren’t super long lasting. Therefore, I think that with this product, regardless as to whether you use it as a bubble bath or a shower gel you will need to use a fair bit, which in fairness is written on the tube anyway! I still like it, but when compared to Gilchrist & Soames sea-mineral based soap from the last box, I think that the results are the same with G&S winning on the longevity of both how long the soap lasts (by using less of it) and how long the bubbles last in the water, too! 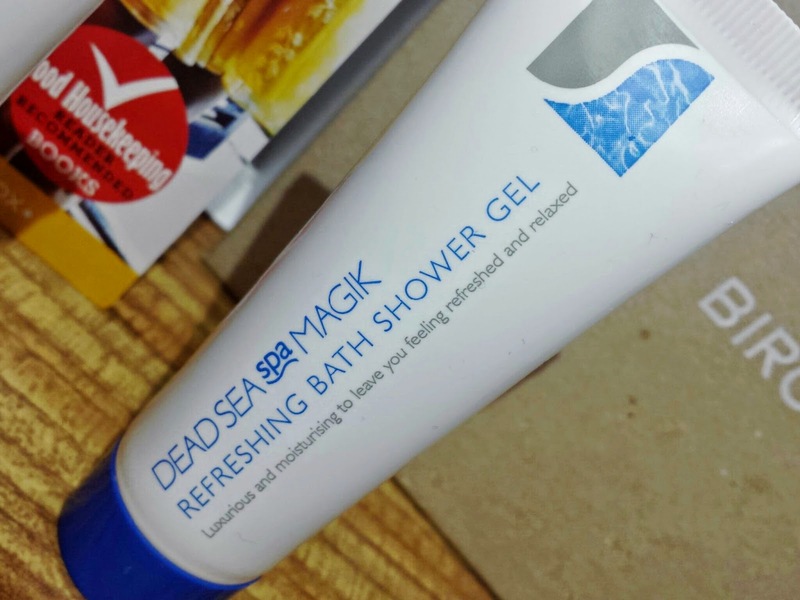 Dead Sea Spa Magik does win on price though and quantity, coming in over £3 cheaper than G&S whilst containing 350ml in a bottle compared to G&S that contains 236ml. You can pick up a full size bottle from Birchbox for £7.15 for 350ml. As you may be aware, I recently converted to the “no-poo” method. The no-poo method is basically a way to wash your hair without using shampoo & conditioner. For more information on the no-poo method, please check out my post all about it here! When you decide to go no-poo, you become a lot more wary about what products go near your hair. Thankfully to say, this spray on leave-in conditioner is silicone and SLS free! It is also paraben free, gluten free & 100% vegan, so I tested it out as my conditioner after using bicarbonate of soda as my shampoo. This spray claims to help with de-tangling, strengthening, taming fly aways, protecting and nourishing. However, I then became a little confused. On the Birchbox card included with my box, it states that this spray is a leave-in conditioner, whereas on the website it states to use it after shampoo & conditioner. It doesn’t make any mention of it being a leave-in conditioner on the website. That then made me check up on the Number 4 website for clarification - it can be used as either. As I explained, I have been testing it out as a leave-in conditioner because I hadn’t checked the website prior to doing so and wasn’t aware of it being able to be used for either (lesson learned, people!). I would have tested it both ways otherwise! To use this is really simple; spray onto wet hair and don’t rinse. I find the pump to be a little irritating when trying to get the product out sometimes, but it does cover the hair well and quickly without having to over do it. When used without my usual conditioner (apple cider vinegar) I have found my hair feeling softer and tamer, but still quite tangled. Without using the apple cider vinegar, my hair becomes really, really tangled and can be difficult to brush. I think that it would honestly take a miracle product to work on that! Because of that, I am not going to get overly critical here about how it didn’t de-tangle my hair. Next time I wash my hair I am going to test this out after using apple cider vinegar instead and report back on my results then! I don’t want to create an unfair review for you all. The smell is nice, made up of "A blend of white freesia, golden amber and warm musk” but at the moment it is a little powerful whilst I have Hyperemesis Gravidarum and I have to be careful that it doesn’t trigger any sickness! You can pick up a full size bottle from Birchbox for £20 for 200ml. 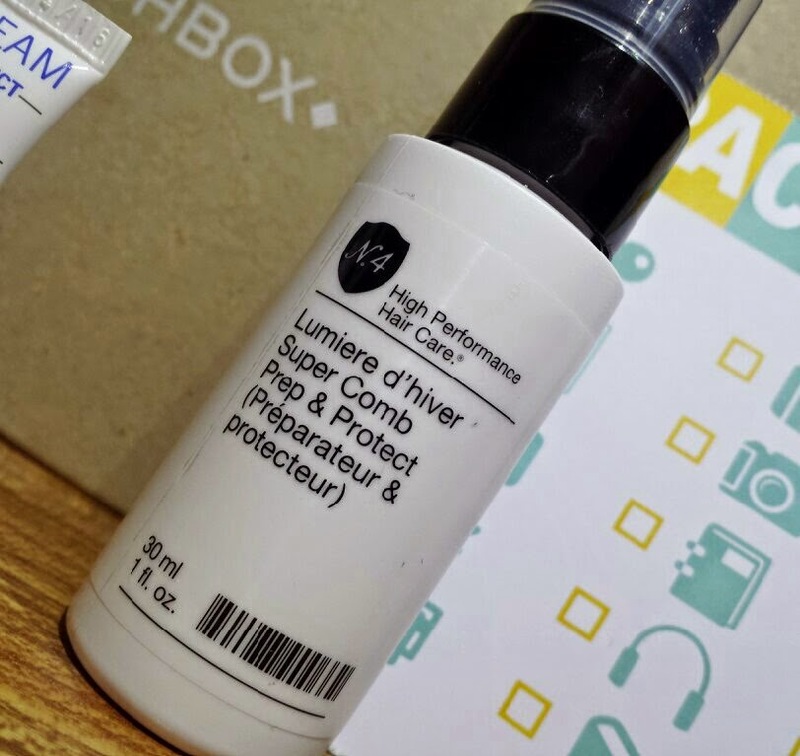 It’s a great thing to hear (you’re probably aware about how much I love skincare and products such as this) and I have honestly been wanting to test out some of their products since I first heard about the launch back at the end of 2012. Admittedly, that was quite a while ago, but at that time I was sort of pregnant with my little man and a lot of other things took priority (such as his room, new things for him and so on). Therefore, I was really happy to receive this! Now, here is the sad part. I finally get the chance to try out a Wild About Beauty product and I can barely even manage to apply the Supergoop CC Cream onto my face, never mind do my face up and pop on some eyeshadow as well. 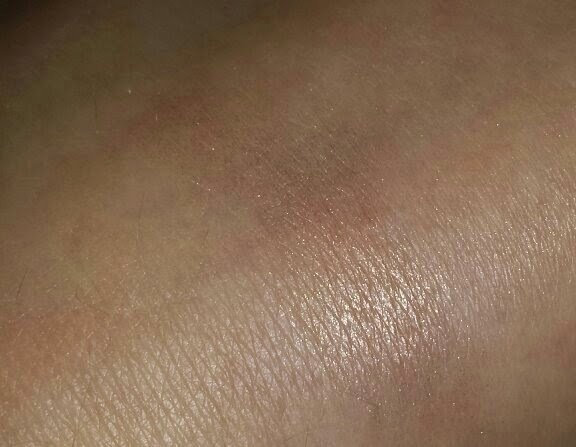 For now, all I am going to be able to offer you all sadly is a swatch on my hand and an explanation of how beautiful the shade is with a promise that as soon as I am able, I will do a proper test of this product. Wild About Beauty explain that all of their eyeshadows are highly pigmented and high-quality made with natural skin soothing products such as Vitamin E and C as well as aloe vera. Vitamin E is great for hydration, protection from free-radicals, puffiness, dark circles and repairing skin cells. Vitamin C helps to revive the eye by brightening and tightening and aloe vera is a moisturiser, anti-inflammatory, skin healer and also helps with puffiness and dark circles. Whilst you’re not going to be using the eyeshadow as an all-over eye product, your eyes will still be receiving the benefits where you do apply it! They also claim that the shades available at Birchbox are all natural, easy-to-wear and suitable for every skin tone. I received the shade Aine, which is a natural bronze shade. The colour is really difficult to capture in a photo, so hopefully you should be able to see how it looks here! You can buy a full size eyeshadow from Birchbox for £13 for 2.5g. I was rather surprised and happy to see that Birchbox provided a book chapter sampler in this months box! After filling out the survey about it on my account, it seems that the questions about it made it pretty clear that this could probably happen again in the future depending on how many people did enjoy receiving it. I think that is a brilliant idea to receive books. 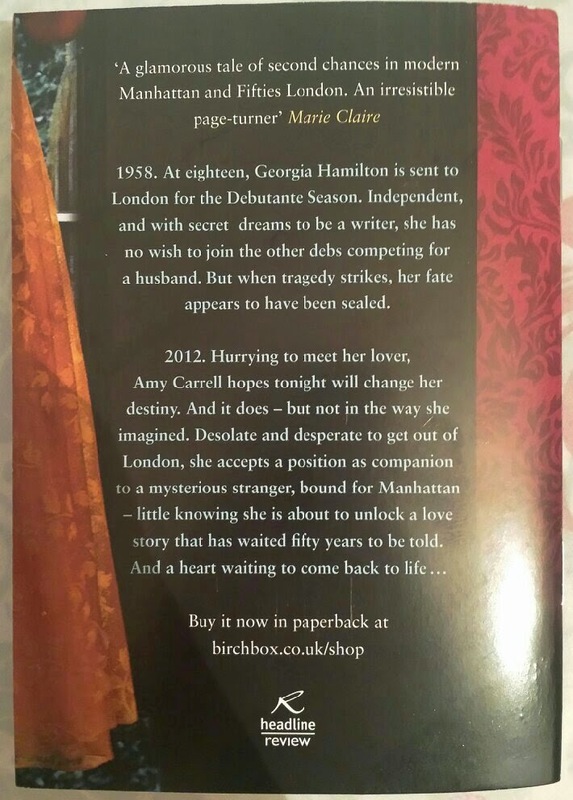 I love reading and it’s will be a fantastic way to discover new books! However, every person also has their own particular taste in books. 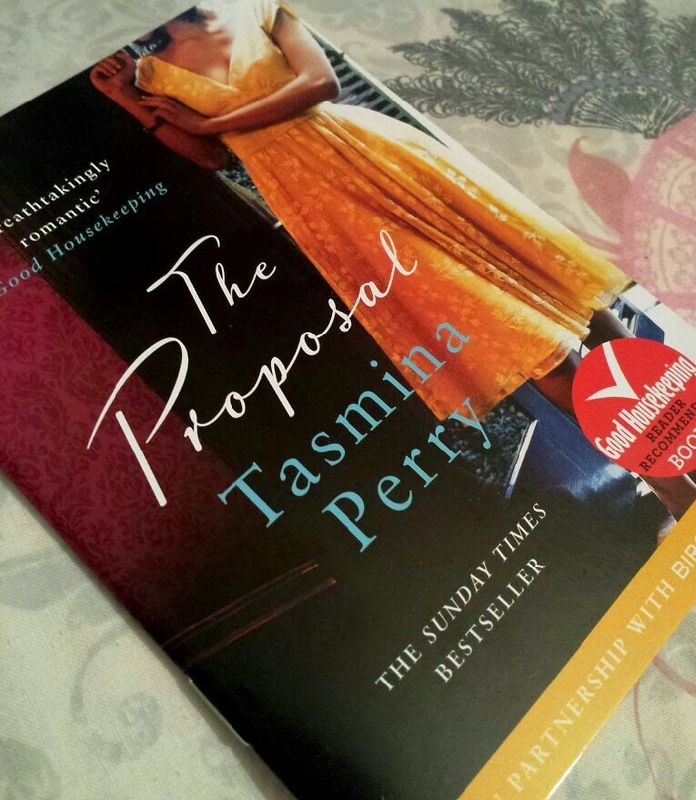 The Proposal for me sadly doesn’t appeal, but it is the type of book that is right up my sisters street! 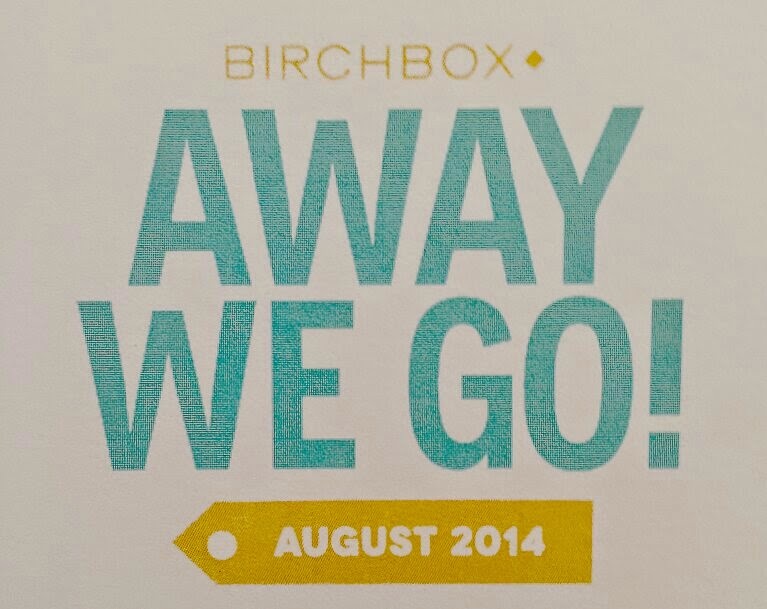 I am incredibly open to Birchbox providing more chapter samplers in the future. Even if the book isn’t my style, by providing different genres they could end up with a healthy amount of book sales on their site too! 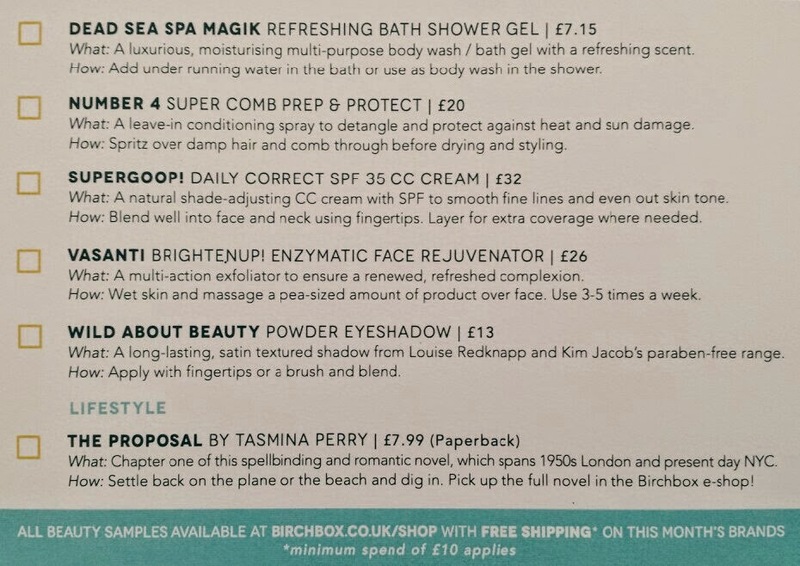 You can buy the book for £7.99 from Birchbox. I really liked the addition of the toiletries bag this month as well! This time of the year is definitely the time to receive it and I will be definitely getting some use out of it! Whilst that won’t be right now due to not feeling that fantastic, it’s going to be helpful for lots of future endeavours. The only issue for me is that my bag sort of won’t undo. I have to revert back to pulling it open and then using the fastener to do it back up again. It’s not the end of the world though, and I will still get use out of it! I think that this months box is a fantastic one! 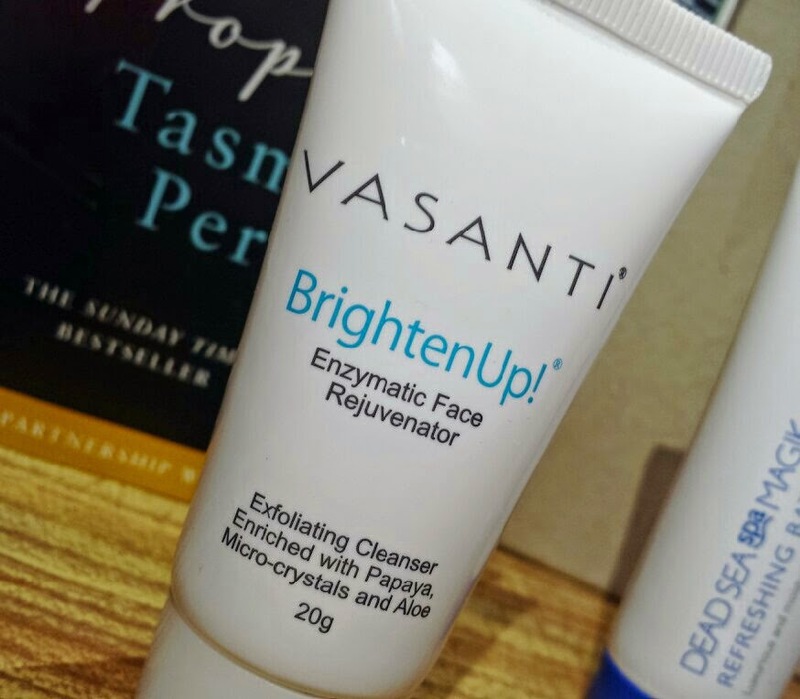 My top pick of this box is the Vasanti - Brighten Up exfoliator. I wanted to say pretty much all of them but I forced myself to choose one favourite!